A Tamil Tiger guerrilla has been arrested in Chennai along with two accomplices — including an Indian — on charges of smuggling war materials to the rebels in the island nation. The Q Branch of the Tamil Nadu Police — which deals with insurgent activities — made the arrests late Saturday near the international airport in Chennai, a statement from the police said on Sunday. The three were identified as James alias Raja, 46, and Jayakumar, 34, (both Sri Lankans) and Ravi Kumar, 42, an Indian. 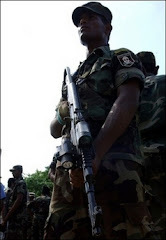 Jayakumar reportedly told the police that he belonged to the Sea Tigers, the LTTE's sea wing, from 1995 to 2006 during which he took part in battles against the Sri Lankan military. Jayakumar added that after quitting the Sea Tigers, he sailed to Thanjavur in Tamil Nadu in early 2007 by boat on the orders of Soosai, the Sea Tigers leader. He is from Velvettiturai in Jaffna where LTTE chief V Prabhakaran was born. James, who belongs to Mannar in Sri Lanka, said he visited India thrice this year using his passport. He later flew to India in October 2007 and then went on to buy for the LTTE computer spare parts, underwater footwear, global positioning system and bundles of beedis, the statement said. Police seized Rs 4, 78,290 and Rs 4,140 worth Sri Lankan currency and four mobile phones from the group. The men, according to the police, had tried to hire a boat. The boat was reportedly being harboured in Mallipattinam on the Thanjavur coast, about 450 km south. Jayakumar reportedly said he went to Thanjavur and bought it for Rs 4,80,000 sent by Soosai and an LTTE fund controller based in London. Police said Jayakumar had admitted that he had planned to send the boat to Sri Lanka with James. The Indian arrested is said to have helped the Sri Lankan Tamils buy the boat. Tamil Nadu is separated from Sri Lanka by a strip of sea. Although the Tamil Tigers do not enjoy the kind of support they had in the state in the 1980s, there are still committed sympathisers to the LTTE cause of a separate state.